This piece was written for a “Show & Tell” assignment in Anne Short’s Reminiscence Writing workshop at the Westside Senior Center, in Spring 2006. I became the workshop leader in Spring 2008 when Anne retired. Most children have a first stuffed animal; usually, I understand, this is a teddy bear. For some reason my parents presented me with a stuffed fox instead, perhaps inspired by my thick mop of red hair. 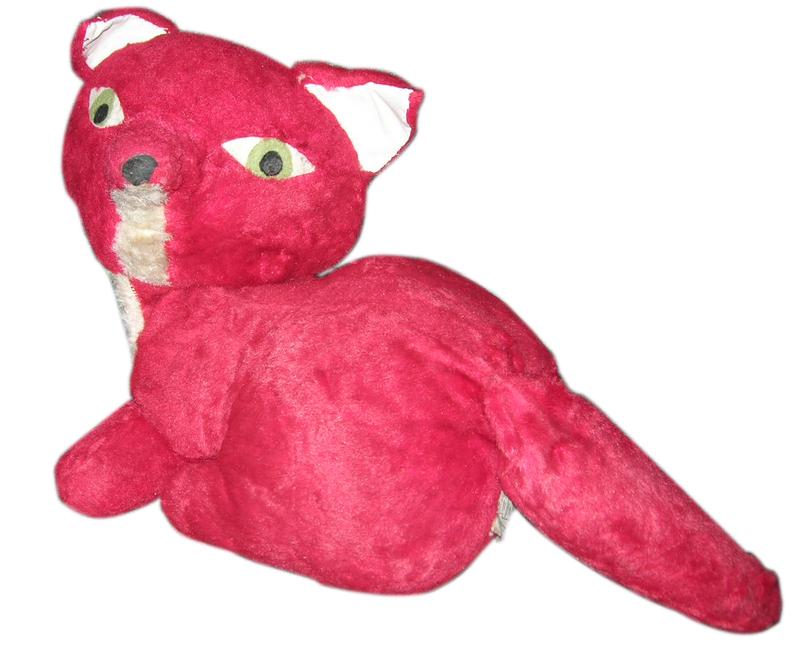 I don’t remember receiving Foxy – just note him as “present” when I called the roll at bedtime in my narrow cot, surrounded by dozens of stuffed critters both homemade and store-bought. Foxy was the leader and president of them all, and slept closest to my head. When I was about five years old, my family began making camping trips. One spring weekend we set out for Kentucky. The trip from Indianapolis to the southeast corner of the state passed in a few pleasant hours. When we crossed the bridge over the Ohio we cheered. On the other side we came to a scenic overlook with a sweeping view of the Ohio River valley, and we stopped to stretch our legs. Foxy would enjoy this view, I knew! So I took him out of the car with me and set him on the stone ledge where he could see the woods and river below. “Do you need to use the bathroom?” That was my mother. “Tackle!” That was my brothers, rough-housing as usual. “What a view! Now everybody back in the car,” That was my father, finishing his cigarette by the low stone ledge. “Oh dear!” The concern in my mother’s voice was real. I thought of the fire in his green felt eyes, and knew what she said was true. I had a strong imagination and my family encouraged this anthropomorphic streak in me. I would be hard put to tell you which of my friends were live and which were stuffed. I took comfort in the idea he was in the natural setting he loved, making new friends, just as we were on our camping trip. That summer gave way to fall. I still had my herd of stuffed buddies for company, but no animal moved to the position of authority Foxy had held. As winter came on, my little heart ached sometimes to think of him, out there in the frigid woods. And then the Christmas season approached with its distractions, and finally – Christmas morning. I ran out of my bedroom at first light. What was that under the tree? “Foxy!” I squealed. Here he was, back in my home, back in my arms! But time had changed Foxy. When I last saw him, he carried himself in a running stance. Now, he sat on his haunches. “I think he must be very tired from running all the way here from Kentucky,” my mother explained. And that was good enough for me. Foxy and I have been inseparable ever since. “Show & Tell” is often suggested as a writing prompt. What object in your possession brings back memories you’d like to write about? This entry was posted in Sarah's memoir, Writing prompt and tagged Carmel. Bookmark the permalink.